So often I have looked at the above photo of Empress Alexandra's Imperial Easter Eggs displayed in the corner cabinet of the famous Maple Room* in the Alexander Palace. To see the Eggs where they were put by their owner is really special. 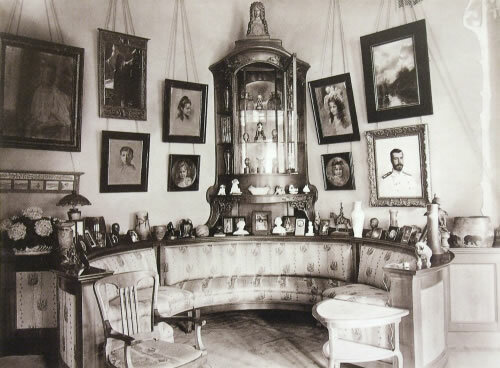 I love the photo too for the magnificent portraits on both sides of the cabinet by Friedrich August Von Kaulbach (1850–1920) of the four beautiful Grand Duchesses, and the portraits of the Tsar and Alexei the heir; this sure is the Empress' corner! So much already is written about this Maple Room, this corner, this cabinet. Even the Eggs inside the cabinet are identified with more or less success. Just for myself I wanted once and for all to determine which Imperial Easter Eggs were displayed in the cabinet. I could guess but I love to have proof! Alexandra Feodorovna received 20 Imperial Easter Eggs, starting in 1895 with the Rosebud Egg and ending in 1916 with the Steel Military Egg. Here below are pictured all twenty Eggs. Back to the Alexander Palace. The above photo of the Maple Room is said  to be made circa 1914. We clearly see the 1913 Romanov Tercentenary Egg, so we know that this photo was made after Easter 1913. We do not know however, if the photo was made before or after Easter 1914 when the Empress received the 1914 Mosaic Egg. So by the time the photo was made, Empress Alexandra had received either 17 or 18 Eggs. The ten in the Winter Palace and the seven or eight Eggs below. Eggs for the years 1915 and 1916 still had to come. From an unfortunately very grainy enlargement we can none the less clearly identify six of the seven Eggs in the cabinet. Those on the lowest shelf can only be from left to right, the 1908 Alexander Palace Egg, the 1909 Standart Egg and either the 1912 Tsarevich Egg or the 1914 Mosaic Egg. The Alexander Palace Egg is 11 cm in height, the Tsarevich Egg is 12,5 cm and the Mosaic Egg 9,5 cm. As the right Egg on the lowest shelf in the photo is at least as big (if not bigger) as the Alexander Palace Egg, only the Tsarevich Egg fits here. * In Fabergé literature this room is very often misidentified as the Mauve and or Lilac Room. Now that the Empress Alexandra Feodorovna's Eggs have their own page, Empress Marie's Eggs deserve one too.